I’ve written at length previously about the Intuit Partner Platform, a platform that aims to allow third party developers to build solutions that integrate with QuickBooks. I’ve always loved the concept of IPP – I believe that, especially for SMB customers, providing a rich common data model is key to driving the benefit of cloud applications. While APIs go some way to doing this – the idea of using multiple apps across a platform that takes care of common data and authentication is powerful. I took some time to talk to Alex Chriss, Director of Intuit Partner Platform, about what this all means. I started out by suggesting that Intuit Anywhere was, at least in some ways, an admission that the world has moved on from things being on any one platform. Whereas in another time Intuit would have been focused on driving the maximum number of eyeballs to the QuickBooks application, the reality is that they are much better to enable all the different employees who interact with SMB software to have an involvement with Intuit – on, or off, site. Chriss agreed with this contention, he pointed out that while QuickBooks may have five million customers in the US, these businesses have an estimated 28 million staff. The reality is there are generally only one or two people within a business who interact with QuickBooks, a play like Intuit Anywhere allows all employees the opportunity to interact with rich business data – a staff member filling out a leave request, someone working on the business website, or someone developing an email campaign. The other aspect to this move is that it’s fair to say that previous iterations of IPP, while promising hugely, didn’t gain real buy in from developers. True they snared most of the popular standalone SMB applications, but they didn’t really get new developers excited. With Anywhere, Intuit is really lowering the bar or developers and making it that much easier for them to build applications that leverage core business data. That strategy should hopefully see some blue skies applications created on the platform. Intuit Anywhere is great for two reasons. For one, having a high quality online API for QuickBooks and QuickBooks Online has made it possible for us to build an integration with QuickBooks that lives up to our customers’ expectations. IPP provided this before, but Intuit Anywhere makes this API accessible from inside the FreshBooks user experience. That makes all the difference. 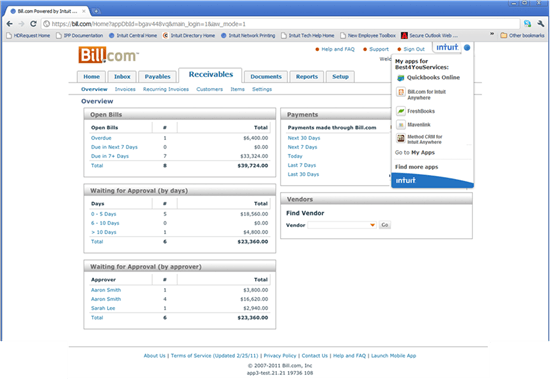 Second, Intuit is really stepping up to build an ecosystem for small business software with Intuit Anywhere. We are excited to be marketed in the ecosystem around QuickBooks. By connecting their millions of customers with the wider market online, Intuit could very well expand and strengthen the online small business software market significantly. According to the release, “Once certified, Intuit Anywhere-enabled apps will be available on Intuit App Center and Intuit Anywhere will be generally available this fall”. I have some concerns about the certification process – talking with developers already on the IPP, or going through the process of joining, it seems that certification is a length and difficult process – hopefully Anywhere speeds things up and lessens the number of hoops that developers need to go through. Disclosure – I’ve previously done some consulting with Intuit – see my disclosure statement.